Wipe Konbu kelp with damp cloth to clean. 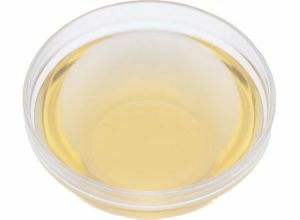 Fill a bowl with cold water and soak kelp for about 30 minutes. Transfer the kelp and water to a large pot, and place it over the medium heat. When small bubbles appear from the bottom of the pot, remove the kelp immediately. When water is boiled, add all the dried bonito flakes at once. Wait until the entire dried bonito flakes sink in the bottom of pot. 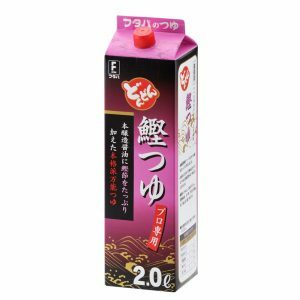 ・This broth is suitable for simmered dishes and soups. 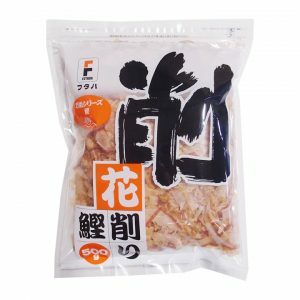 ・Do not squeeze liquid from the remaining dried bonito flakes to keep soup clearer. ・Do not boil water while the kelp is in the pot to avoid sliminess from kelp. 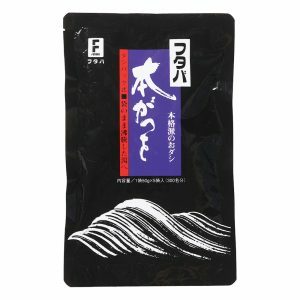 Mix DonDon Katsuo Tsuyu and water, chill in refrigerator for cold sauce, heat up in a pot for hot soup. 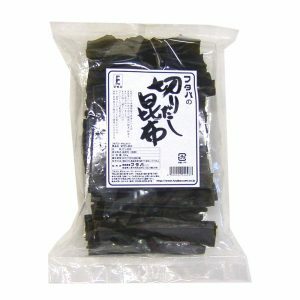 Cook buckwheat noodle in plenty of boiling water as long as indicated on product packages. Stir them to avoid noodles to stick together. Check the firmness by trying one. Take noodles in a sieve basket and rinse with fresh running water, then drain water well. 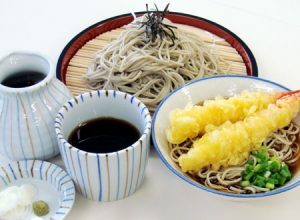 For cold style noodles, arrange noodles in portion and serve with chilled sauce in other dipping bowl. For hot style, arrange noodles in a bowl and pour hot soup. 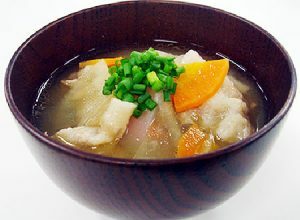 Cut white radish and carrot in quarter-rounds, burdock in diagonals, parboiled Kon-nyaku and Abura-age in rectangles, and pork in a bite size. Cook vegetables (radish, carrot, burdick, and Kon-nyaku) in 800ml DASHI soup on the medium heat. Add pork and Abura-age when the vegetables are cooked, cook until the pork is tender. Place the strainer in the soup pot, add Miso gradually into the soup while softening with some stock and dissolving.Heat until right before boiling, then serve in a bowl and sprinkle the sliced scallion.